Combine two outings to delve into the world of impressionism and explore at your leisure. Your day will begin when you pick up your audio tours at La Marina. Then you will head directly to the Musée d’Orsay, which is a 5-minute walk from Port Solferino. You will have approximately two hours to visit this museum in its unique setting: a former train station on the banks of the Seine. You will discover the world's biggest collection of impressionist and post-impressionist paintings as you follow the tour and listen to commentary from your audio guide about the major works, such as: "Dance at Moulin de la Galette" by Auguste Renoir , "The Gleaners" by Jean-François Millet, "Small Dancer, Aged 17" by Edgar Degas, "Luncheon on the Grass" by Edouard Manet, "The Card Players" by Paul Cézanne , "Poppies" by Claude Monet, "Arearea, or Joyousness" by Paul Gauguin and "Starry Night" by Vincent Van Gogh. Between 12:00 pm and 1:15 pm, you will have free time to have lunch wherever you like. After your meal, you will return to our agency at 1:15 pm and board our air conditioned motor coach. You will arrive at the Giverny Gardens after about 1.5 hours of driving. Now it's time to discover the village in Normandy where Claude Monet spent the last 43 years of his life. 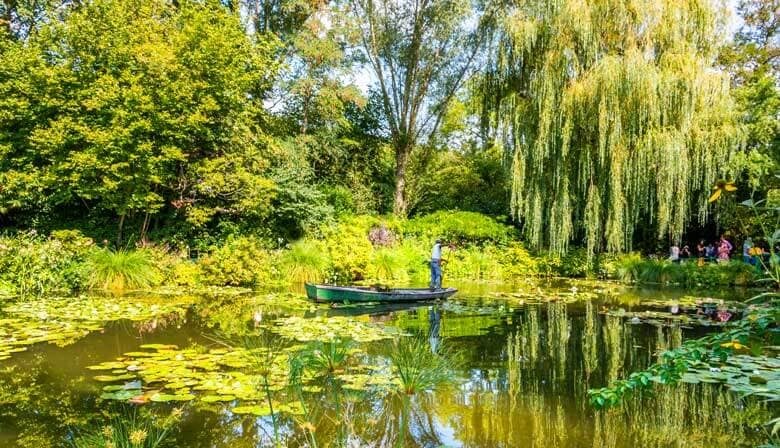 You can begin your outing with a tour of the Monet home to set the mood by learning about the day-to-day life of this master of impressionism. You will walk through the blue sitting room, the pantry, Claude Monet's first workshop, the kitchen and the dining room, where a significant collection of Japanese engravings is on display. Next you will head upstairs for a look at the private quarters. Audio guides for Orsay museum should be picked up at La Marina before departure against a deposit of €30. The audio guides have to be given back at La Marina. Transfer between La Marina and the Orsay Museum and between La Marina and PARISCityVISION agency. You will receive your confirmation and your tour voucher in 2 separate emails. Please print your tour voucher and present it to La Marina on the day of your departure. Very relaxing afternoon. Wished I had spent extra time visiting Monet's grave and the town. I could have easily made this a day trip.